Society Dig at Holman Springs saltmaking site in 1985. 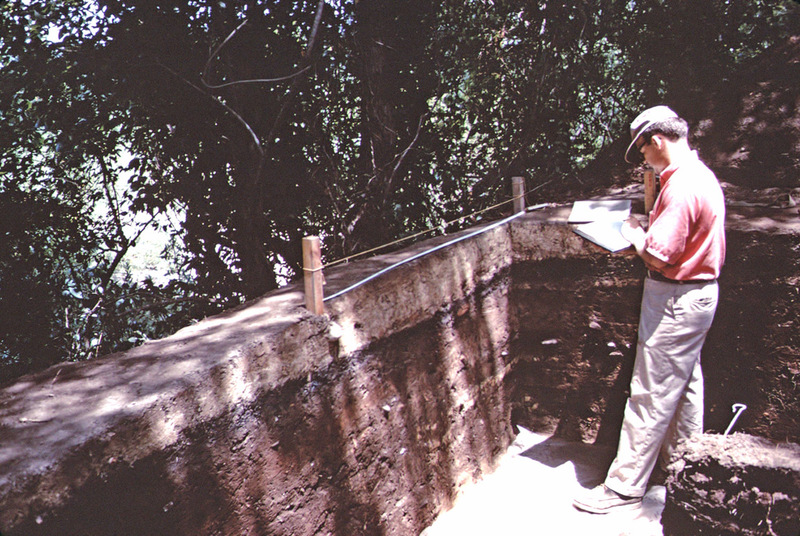 Water screening at Holman Springs during the 1986 Society dig. People throughout the world have been collecting and making salt for thousands of years. This vital resource has been used to flavor and preserve food, as a form of currency, to boost an economy through sale, trade, and taxation, and for many other purposes. Scholars still debate whether salt is more important as an essential part of human diets, or whether its popularity as a flavoring spurs the insatiable demand. Historians, economists, nutritionists, archeologists, and other scholars all have studied the technology of saltmaking and the role of this activity in societies. The Arkansas Archeological Survey’s archeologists began research into saltmaking cultures in the state soon after the Survey was formed, and that research continues today. Several locations in Arkansas, primarily across the southwest quarter of the state, have saline springs where brine can be rendered into salt. Groundwater picks up ancient salt from geological deposits that were formed when a shallow sea covered most of the state, and brings it to the surface as brine. The brine can be converted back into useable salt by evaporation. The hot summer sun can convert small puddles of brine into salt naturally, but useable amounts of salt can only be made by cooking. Native people in Arkansas began making salt nearly a thousand years ago. We have found numerous archeological sites where prehistoric saltmaking took place. European explorers and settlers came upon several of these sites and tried to make salt on an industrial scale through much of the 19th century. They discovered that Arkansas brine springs were not strong enough to produce economically viable salt in competition with underground salt mines and the vast solar salt drying operations along the seacoasts. As a result, the prehistoric saltmaking settlements were not destroyed by later industry and remain for archeological investigation. Map of excavation locations and features at the Hardman saltmaking site, 1987 excavations. 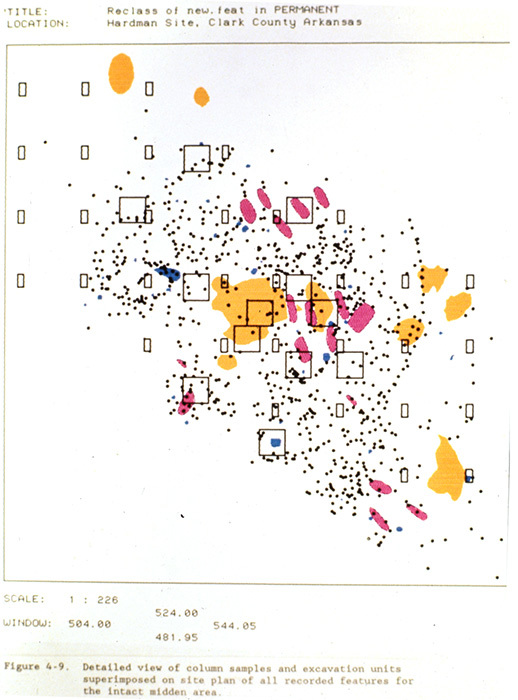 Yellow areas are burn locations, pink areas are graves, blue areas are storage and garbage pits, and black dots are post stains. 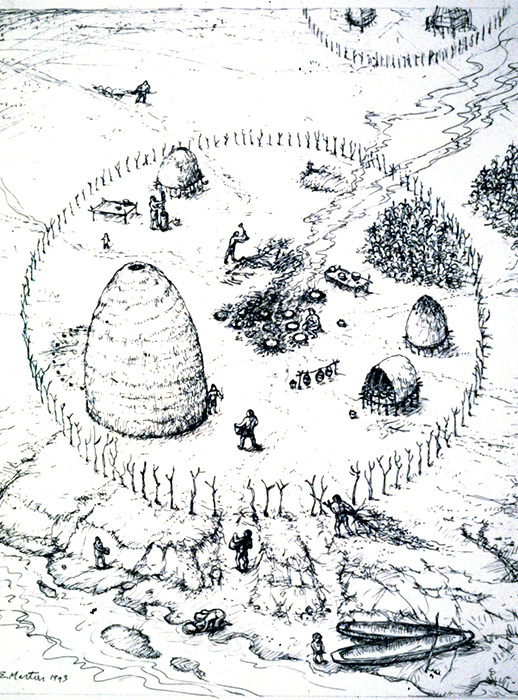 Reconstruction of the Hardman site saltmaking family compound at about 1500 AD. Artist: Ed Martin. Organizing artifacts by catalog number at the VoTech school in DeQueen, site of the 1986 Holman Springs Society Dig laboratory. In 1939 Harvard archeologist Philip Phillips visited several saltmaking sites along the Ouachita River. He paused in his survey to carry out test excavation of one particularly rich deposit known as Bayou Sel. In 1966, Harvard graduate student Frank Schambach, familiar with Phillips’s work, revisited the site and carried out a small excavation. Two years later Schambach became the Arkansas Archeological Survey’s first station archeologist at what was then Southern State College in Magnolia. Within a year, Schambach and James A. Scholtz, who was then the station archeologist at Henderson State Teachers College (now Henderson State University) carried out a large excavation at Bayou Sel. They documented a nearly two-meter deposit of burned soil, ash, broken and discarded pottery sherds, and post molds that marked intense Native American saltmaking activities dating from about AD 1400 AD to 1700. 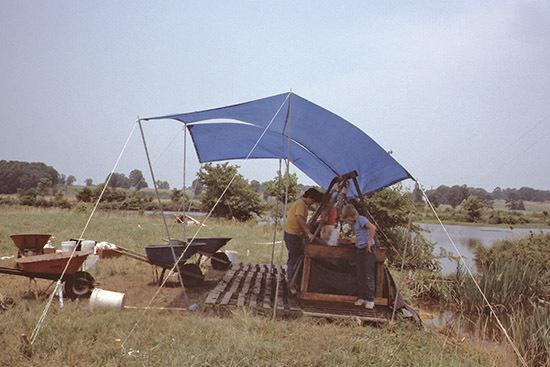 In 1985 and 86, Schambach directed excavations at another saltmaking site in western Arkansas, as part of the Survey/Society Training program for those years. 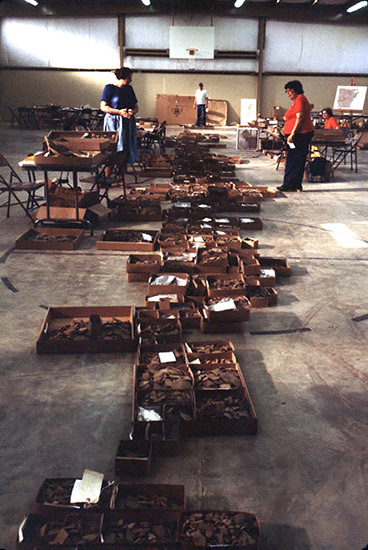 The excavators discovered a widespread area with burning, discarded pottery sherds, building construction, and other activities similar to those at Bayou Sel. In 1987 the Survey undertook a third project at the Hardman saltmaking site on behalf of the Arkansas Highway and Transportation Department. Just across the creek from Bayou Sel, a highway realignment across this large prehistoric saltmaking settlement required excavation of a 3000 square meter strip. The archeologists exposed nearly 1000 features, including burned areas, postmolds, storage pits, and human cemetery areas. The discoveries at Hardman provided interpretive information for the two earlier excavations, and told a substantial story about 300 years of saltmaking by ancestral Caddo people (Caddoan Saltmakers in the Ouachita Valley: The Hardman Site, edited by Ann Early, is available for purchase from the Arkansas Archeological Survey. The Hardman salt site research results are now being used in new analyses of the 1980s excavations. This new research can build on the earlier discoveries and help develop a new set of research questions about Arkansas saltmaking to guide our efforts for the next 50 years. Archeologist Frank Schambach recording a cross section of deposits at the Bayou Sel saltmaking site in 1969.